a pair of still life paintings from the pioneering female painter Fede Galizia (estimate $2/3 million). Celebrated for her still-life painting in Italy and throughout Europe in the first quarter of the 17th century – particularly ones depicting fruit – the present pair is a testament to her sensitive approach to subject matter and acute eye for detail. Galizia’s pared-down compositions rarely depict more than two varieties of fruit and are never overfilled or cluttered , typifying her naturalistic style . Basket of fruit by Caravaggio in the Pinacoteca Ambrosiana, Milan. While it’s possible that Fede was influenced by the intense realism of Caravaggio’s works, her innovative approach to th e genre was unique and unpar alleled during her lifetime, inspiring generations of artists to follow. 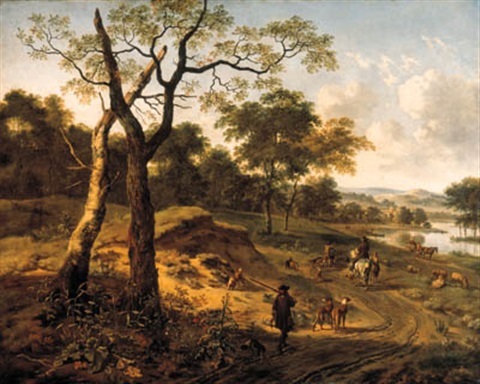 Safra’s collection also features a monumental landscape by Jan Wijnants, one of the most important Dutch landscape painters of the second half of the 17th century. Painted in collaboration with Adriaen van de Velde, Wooded Evening Lands cape With A Hunter And His Dogs, was inspired by the dunes of Haarlem , the artist’s native city ($2/3 million) . The work is further distinguished by its provenance, having been formerly in the collection of the most important collecting dynasties in modern times. The picture entered the Viennese Rothschild collection by 1873 , and thus descended in the family for decades. Displayed in the aptly named ‘Gemäldesaal’ or ‘Museum’ room of Baron Anselm von Rothschild (1803 -1874 )’s palatial home in Vienna, it hung alongside the family’s most important pictures by the best names from the Dutch Golden Age. When the contents of the family’s palace in Vienna were targeted and seized by Nazi authorities in 1938, the collection – including the present work – was removed to the central depot of the Kunsthistorisches Museum in Vienna where it was earmarked for Hitler’s planed museum-complex in Linz. Following the conclusion of the War, the picture was recovered by The Allied Forces’ celebrated Monuments Men from the Nazi storage facilities in the Salt Mines in Alt Aussee before being restituted to Baroness Clarice de Rothschild in 1947 The Wijnants was one of 11 key paintings from the Rothschild collection for which the Kunsthistorisches Museum in Vienna selected in exchange for the grant of a license to export the remainder of the collection to New York. Under the restitution laws introduced in Austria in 1998, the Rothschild family was able to reclaim the ir collection, and so the Wijnants was returned to the family, and sold at auction in 1999 to the present owner. Dated to 1777, Women In Classical Dress Attending A Young Bride (estimate $400/600,000) is one of Joseph - Marie Vien’s finest works in the neo -classical style, and the first of four major works painted by the artist during his tenure as Director of the French Academy in Rome. Though history and religious painting dominated his early career, Vien went on to become one of France’s earliest proponents of neo-classicism – catering to the growing demand for antique and classical subjects. Commissioned by the Comte d’Angiviller, Directeur des Bâtiments du Roi, in 1776, the painting was shown at the Paris Salon of 1779 the first and only museum exhibition to include the work. Vanvitelli’s View Of The Ripa Grande in Rome, is a beautifully -rendered depiction of the Eternal City's main river port (estimate $800,000/1.2 million). One of the leading fathers of the Italian vedute, the present oil on canvas provides a glimpse into daily life at the end of the 17th century. The right side of the painting shows the Via Marmorata, along which marble from the quarries at Carrara was transported, while on the opposite bank are the main ramps of the port, near the Customs House, with the tower of the church of the Santa Maria in Torre behind it. In the distance is the Church of Santa Maria in Capella, the only building in this group that is still standing to this day. Signed and dated to 1690, it is one of the earliest Italian views by the artist, and one of the finest to remain in private hands.